iM-Best(SPY-SH).R1: The model’s out of sample performance YTD is -0.5%, and for the last 12 months is 13.1%. Over the same period the benchmark SPY performance was -0.5% and 13.2% respectively. 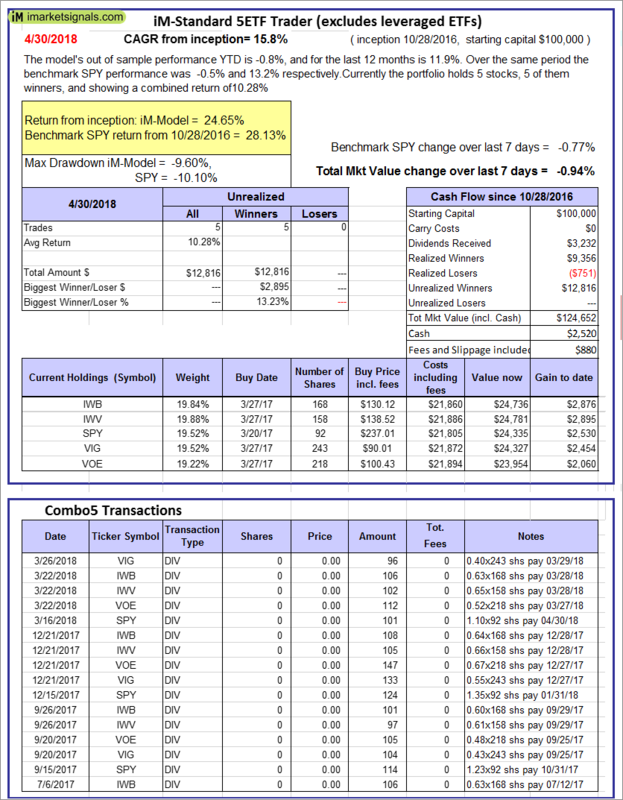 Over the previous week the market value of Best(SPY-SH) gained -0.77% at a time when SPY gained -0.77%. A starting capital of $100,000 at inception on 1/2/2009 would have grown to $562,513 which includes $2,545 cash and excludes $15,369 spent on fees and slippage. iM-Combo3.R1: The model’s out of sample performance YTD is -0.1%, and for the last 12 months is 17.2%. Over the same period the benchmark SPY performance was -0.5% and 13.2% respectively. Over the previous week the market value of iM-Combo3.R1 gained -1.08% at a time when SPY gained -0.77%. A starting capital of $100,000 at inception on 2/3/2014 would have grown to $157,895 which includes -$374 cash and excludes $3,670 spent on fees and slippage. iM-Combo5: The model’s out of sample performance YTD is -1.0%, and for the last 12 months is 17.9%. Over the same period the benchmark SPY performance was -0.5% and 13.2% respectively. 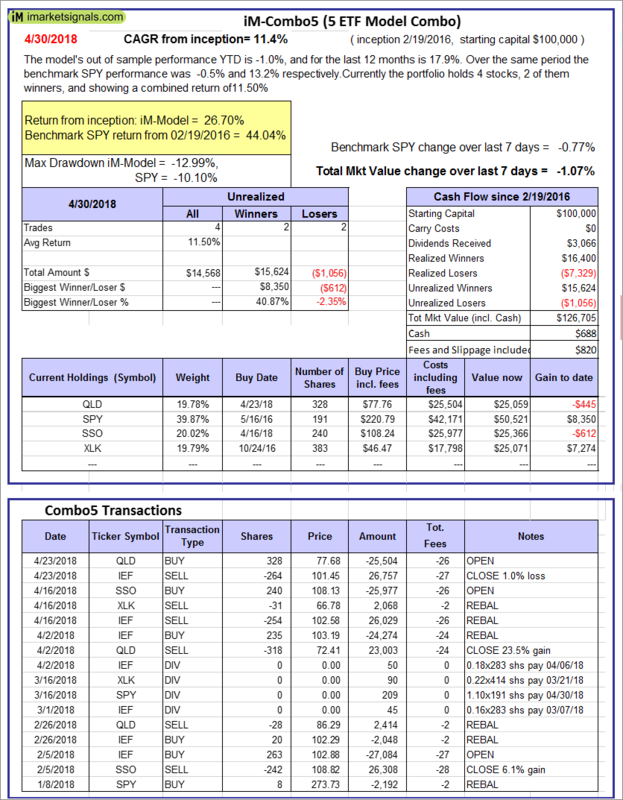 Over the previous week the market value of iM-Combo5 gained -1.07% at a time when SPY gained -0.77%. A starting capital of $100,000 at inception on 2/22/2016 would have grown to $126,705 which includes $688 cash and excludes $820 spent on fees and slippage. 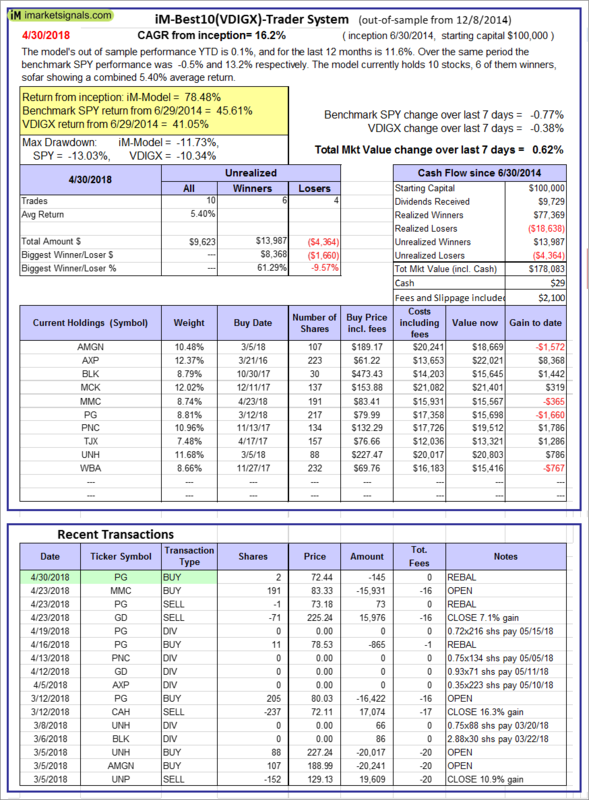 iM-Best10(VDIGX)-Trader: The model’s out of sample performance YTD is 0.1%, and for the last 12 months is 11.6%. Over the same period the benchmark SPY performance was -0.5% and 13.2% respectively. Since inception, on 7/1/2014, the model gained 78.48% while the benchmark SPY gained 45.61% and VDIGX gained 41.05% over the same period. Over the previous week the market value of iM-Best10(VDIGX) gained 0.62% at a time when SPY gained -0.77%. A starting capital of $100,000 at inception on 7/1/2014 would have grown to $178,083 which includes $29 cash and excludes $2,100 spent on fees and slippage. iM-BESTOGA-3: The model’s out of sample performance YTD is -6.4%, and for the last 12 months is 0.4%. Over the same period the benchmark SPY performance was -0.5% and 13.2% respectively. 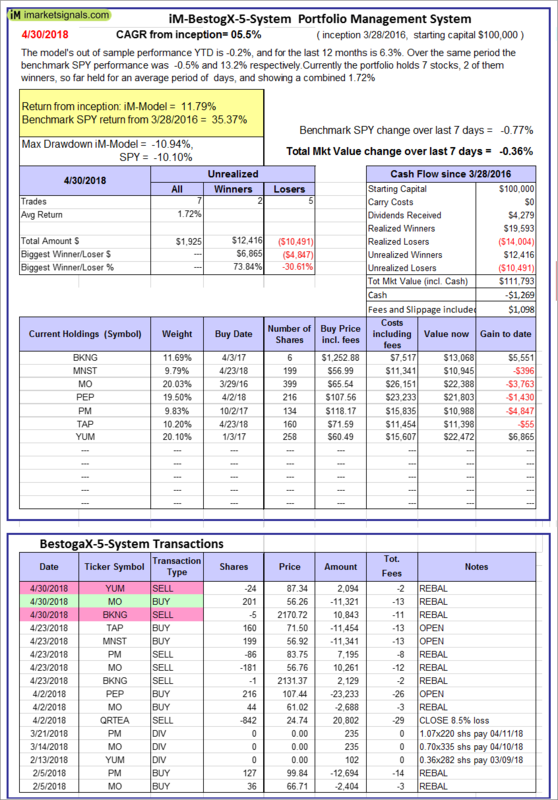 Over the previous week the market value of iM-BESTOGA-3 gained -3.40% at a time when SPY gained -0.77%. A starting capital of $100,000 at inception on 2/3/2014 would have grown to $216,998 which includes -$270 cash and excludes $2,324 spent on fees and slippage. iM-Best7(HiD-LoV): The model’s out of sample performance YTD is -7.5%, and for the last 12 months is -1.3%. Over the same period the benchmark SPY performance was -0.5% and 13.2% respectively. 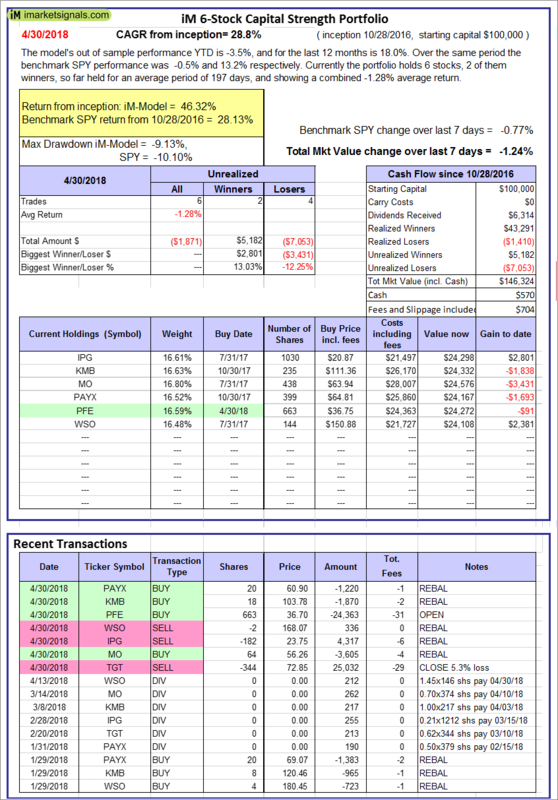 Over the previous week the market value of iM-BESTOGA-3 gained -0.20% at a time when SPY gained -0.77%. A starting capital of $100,000 at inception on 6/30/2016 would have grown to $104,476 which includes $1,023 cash and excludes $1,780 spent on fees and slippage. 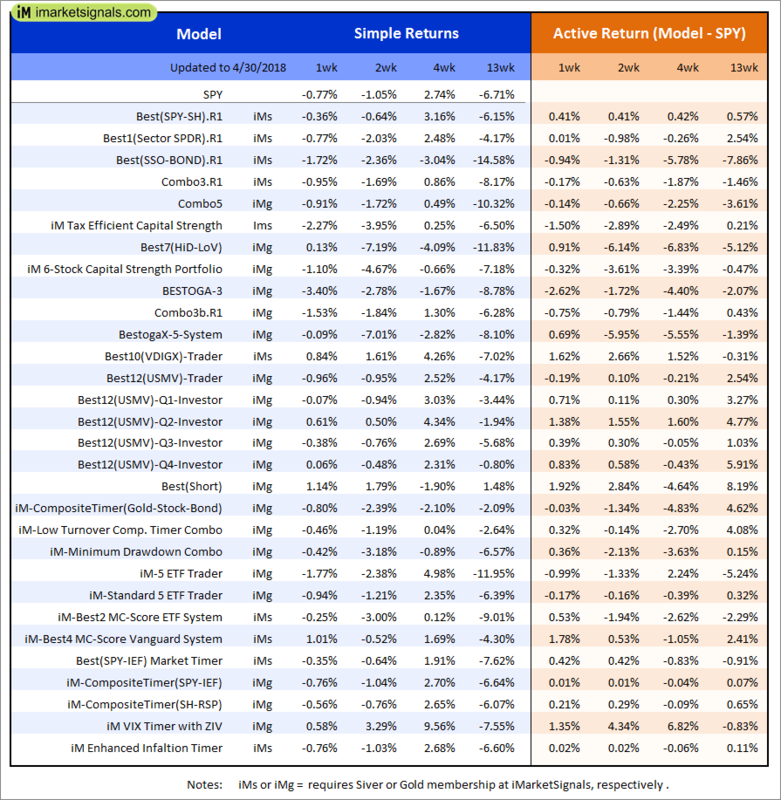 iM 6-Stock Capital Strength Portfolio: The model’s out of sample performance YTD is -3.5%, and for the last 12 months is 18.0%. Over the same period the benchmark SPY performance was -0.5% and 13.2% respectively. Over the previous week the market value of the iM 6-Stock Capital Strength Portfolio gained -1.24% at a time when SPY gained -0.77%. A starting capital of $100,000 at inception on 10/28/2016 would have grown to $146,324 which includes $570 cash and excludes $704 spent on fees and slippage. 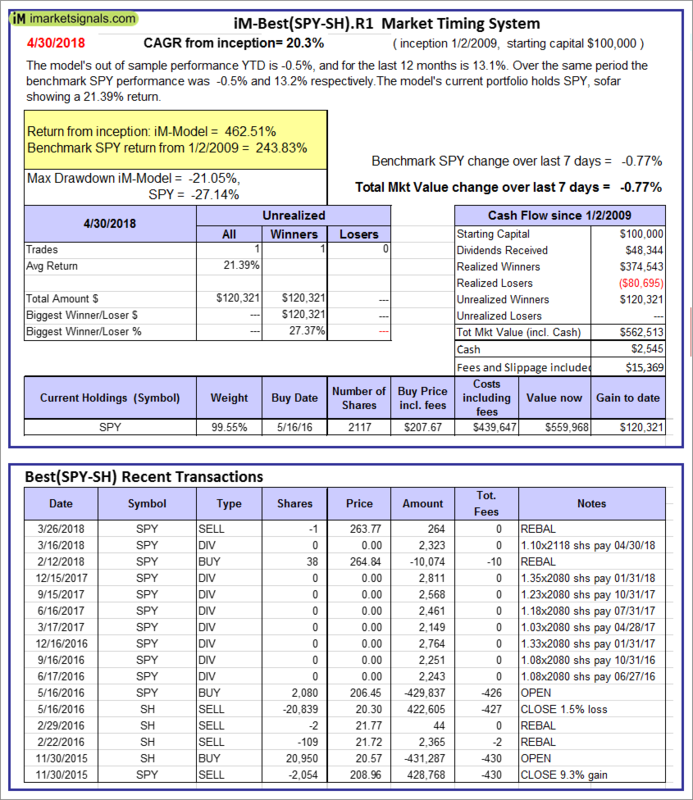 iM-BestogaX5-System: The model’s out of sample performance YTD is -0.2%, and for the last 12 months is 6.3%. Over the same period the benchmark SPY performance was -0.5% and 13.2% respectively. 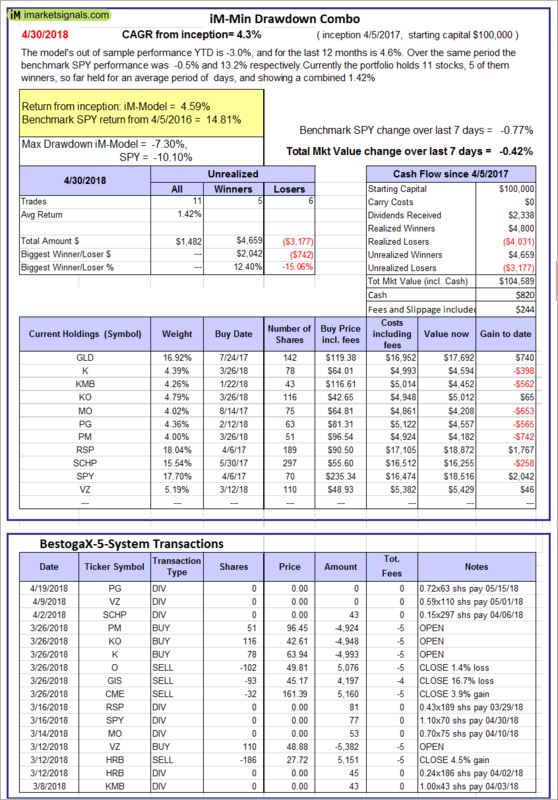 Over the previous week the market value of iM-BestogaX5-System gained -0.36% at a time when SPY gained -0.77%. A starting capital of $100,000 at inception on 3/28/2016 would have grown to $111,793 which includes -$1,269 cash and excludes $1,098 spent on fees and slippage. 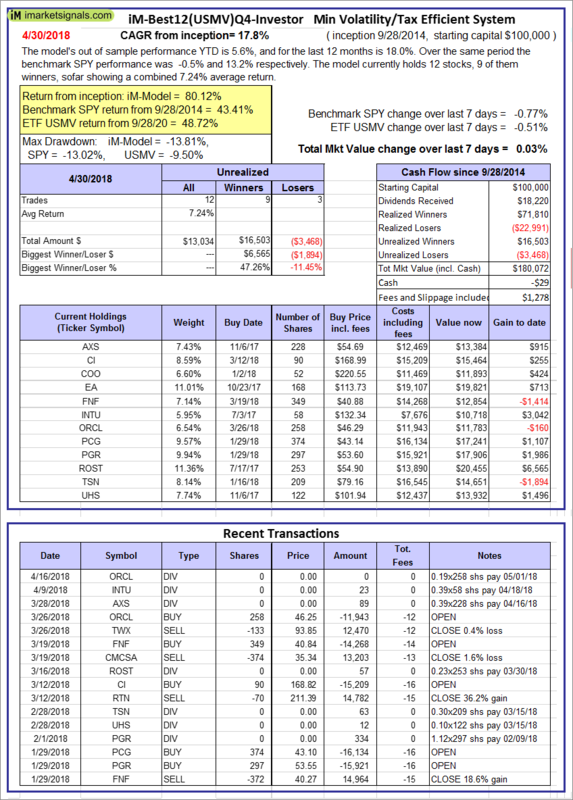 iM-Best12(USMV)-Trader: The model’s out of sample performance YTD is 1.5%, and for the last 12 months is 15.3%. Over the same period the benchmark SPY performance was -0.5% and 13.2% respectively. Since inception, on 6/30/2014, the model gained 73.61% while the benchmark SPY gained 45.61% and the ETF USMV gained 50.80% over the same period. 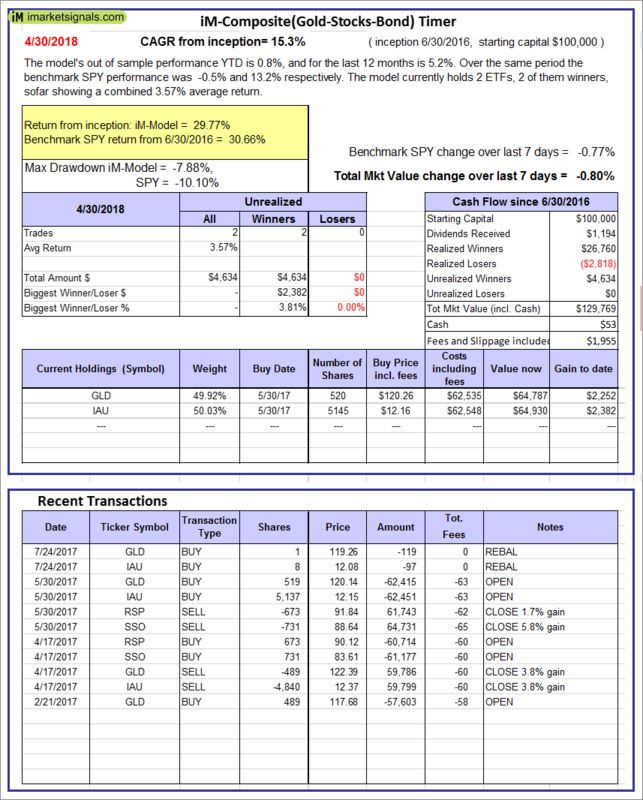 Over the previous week the market value of iM-Best12(USMV)-Trader gained -1.12% at a time when SPY gained -0.77%. 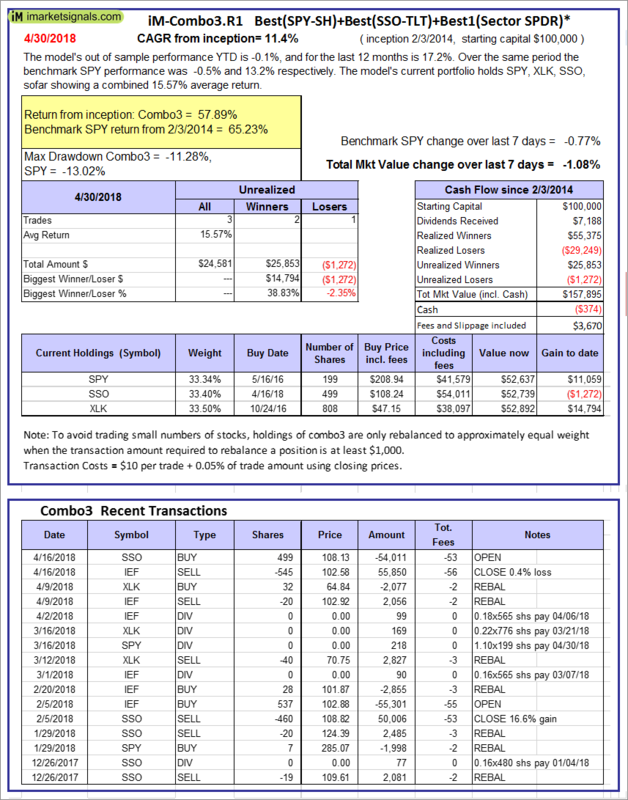 A starting capital of $100,000 at inception on 6/30/2014 would have grown to $173,486 which includes $280 cash and excludes $4,220 spent on fees and slippage. 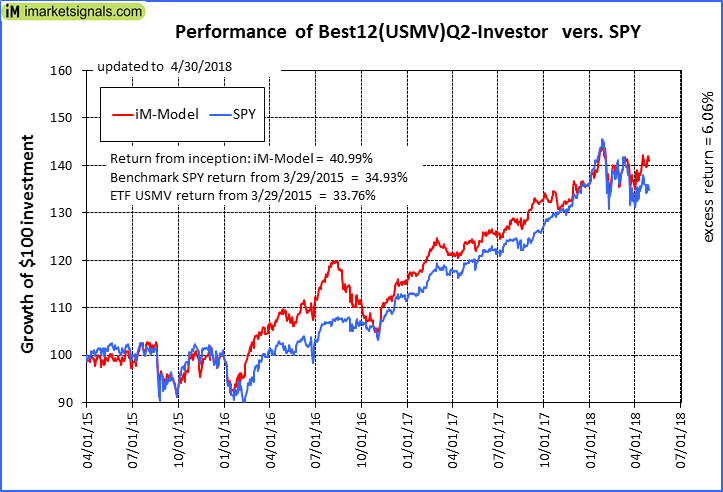 iM-Best12(USMV)Q1-Investor: The model’s out of sample performance YTD is 4.6%, and for the last 12 months is 22.0%. Over the same period the benchmark SPY performance was -0.5% and 13.2% respectively. 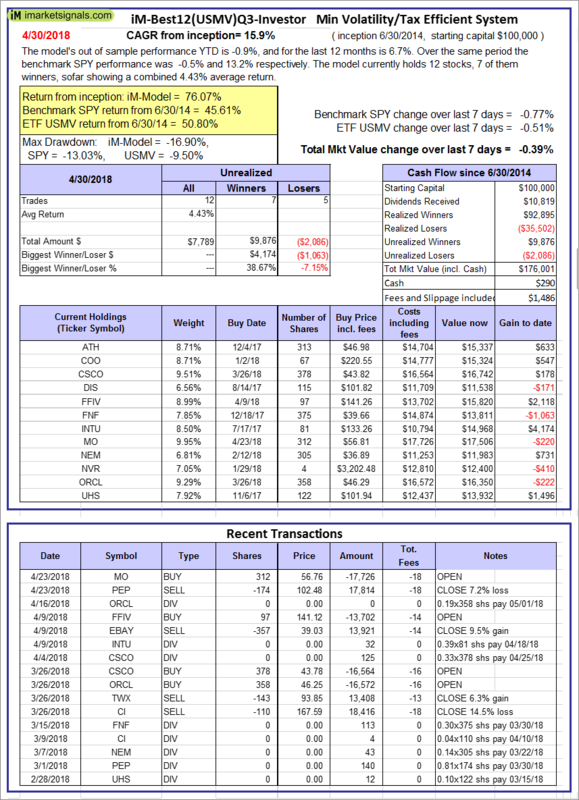 Since inception, on 1/5/2015, the model gained 68.90% while the benchmark SPY gained 39.93% and the ETF USMV gained 38.49% over the same period. Over the previous week the market value of iM-Best12(USMV)Q1 gained -0.06% at a time when SPY gained -0.77%. A starting capital of $100,000 at inception on 1/5/2015 would have grown to $168,849 which includes $297 cash and excludes $1,146 spent on fees and slippage. 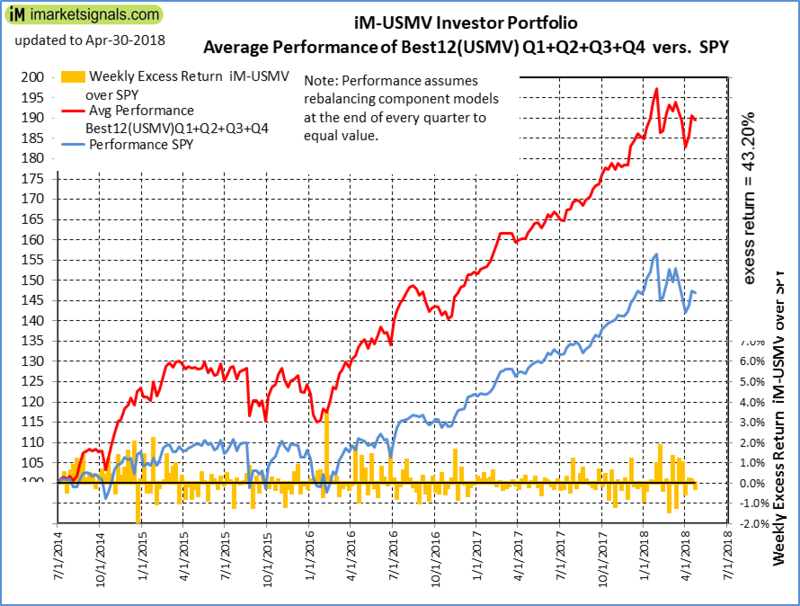 iM-Best12(USMV)Q2-Investor: The model’s out of sample performance YTD is 4.0%, and for the last 12 months is 13.7%. Over the same period the benchmark SPY performance was -0.5% and 13.2% respectively. 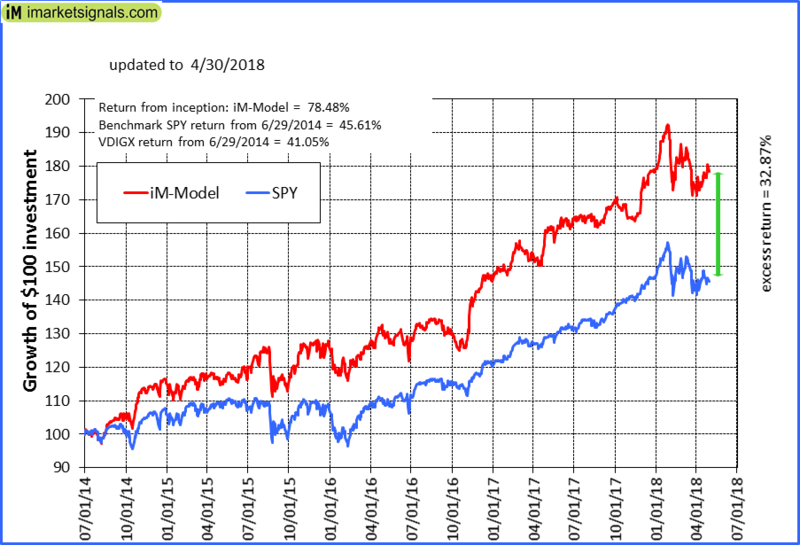 Since inception, on 3/30/2015, the model gained 40.99% while the benchmark SPY gained 34.93% and the ETF USMV gained 33.76% over the same period. 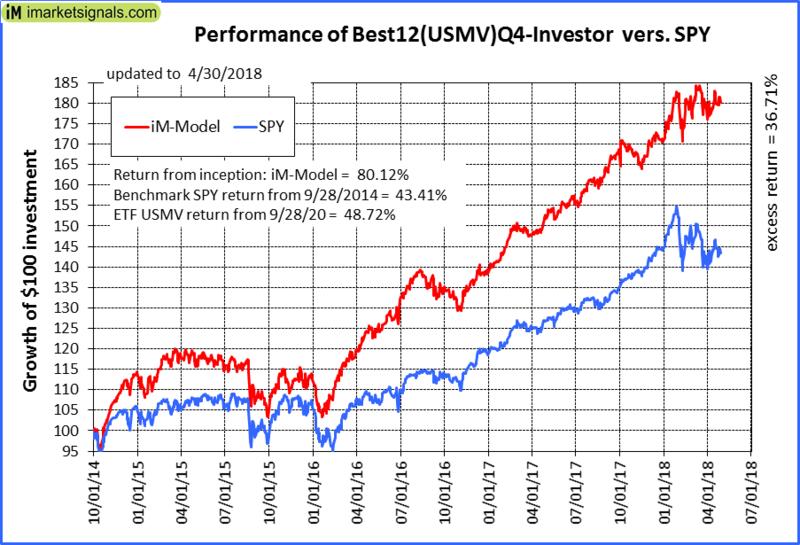 Over the previous week the market value of iM-Best12(USMV)Q2 gained 0.61% at a time when SPY gained -0.77%. A starting capital of $100,000 at inception on 3/30/2015 would have grown to $140,910 which includes $74 cash and excludes $955 spent on fees and slippage. 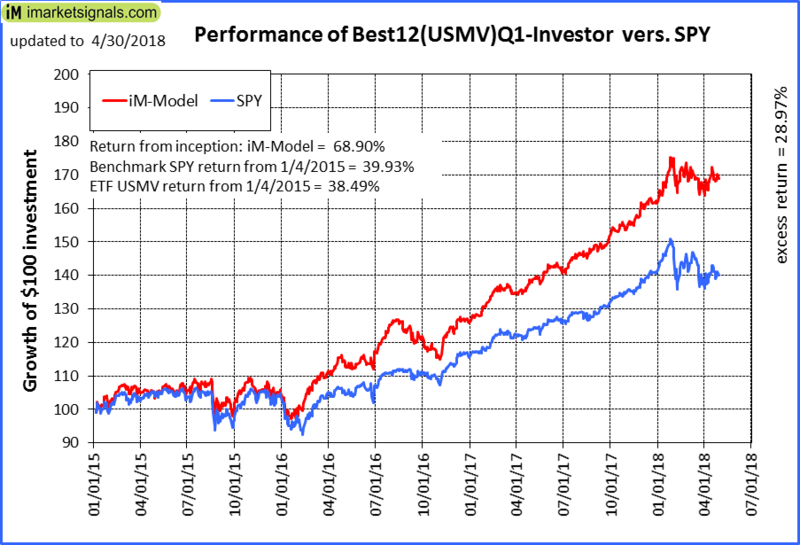 iM-Best12(USMV)Q3-Investor: The model’s out of sample performance YTD is -0.9%, and for the last 12 months is 6.7%. Over the same period the benchmark SPY performance was -0.5% and 13.2% respectively. 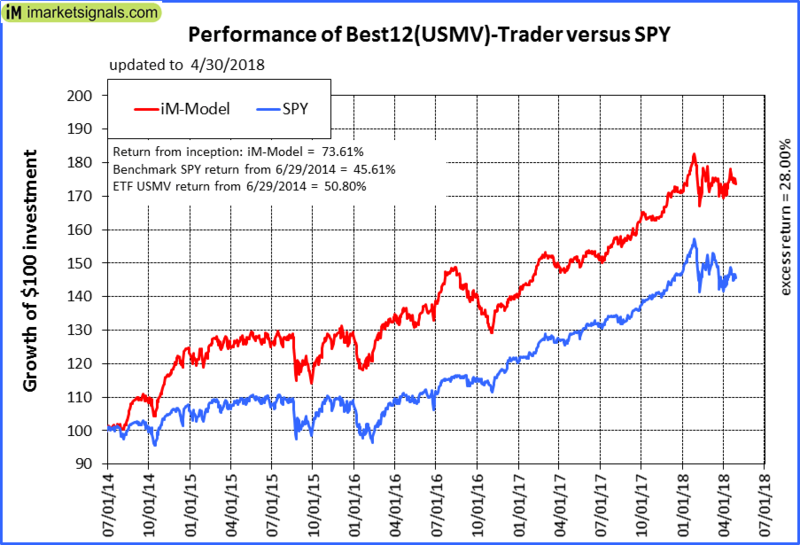 Since inception, on 7/1/2014, the model gained 76.07% while the benchmark SPY gained 45.61% and the ETF USMV gained 50.80% over the same period. Over the previous week the market value of iM-Best12(USMV)Q3 gained -0.39% at a time when SPY gained -0.77%. A starting capital of $100,000 at inception on 7/1/2014 would have grown to $176,001 which includes $290 cash and excludes $1,486 spent on fees and slippage. 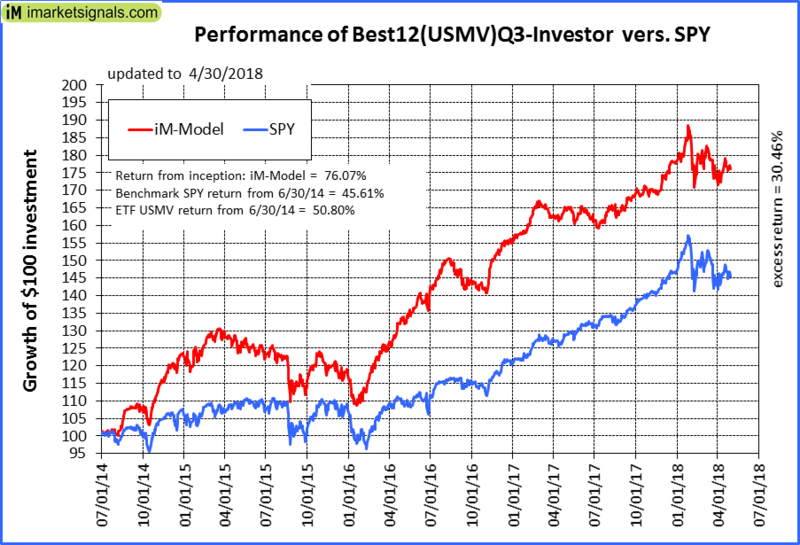 iM-Best12(USMV)Q4-Investor: Since inception, on 9/29/2014, the model gained 80.12% while the benchmark SPY gained 43.41% and the ETF USMV gained 48.72% over the same period. 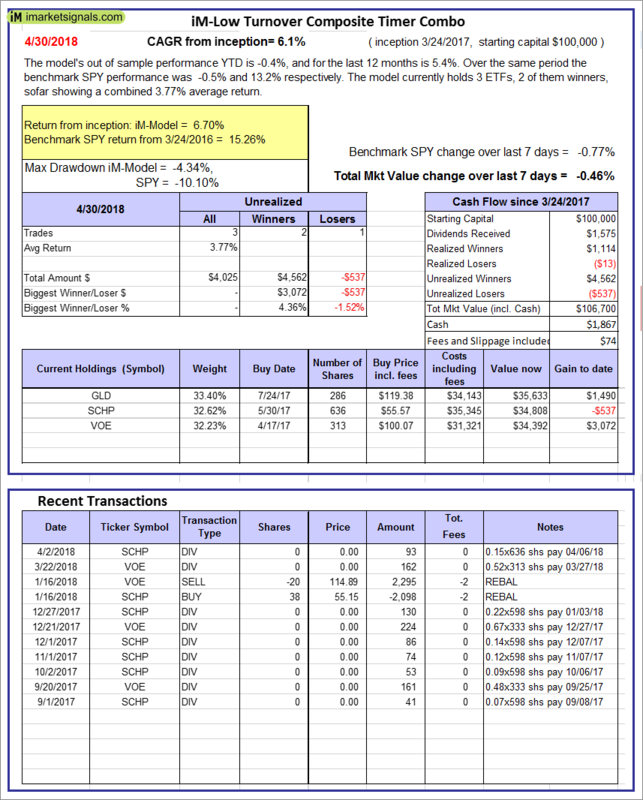 Over the previous week the market value of iM-Best12(USMV)Q4 gained 0.03% at a time when SPY gained -0.77%. A starting capital of $100,000 at inception on 9/29/2014 would have grown to $180,072 which includes -$29 cash and excludes $1,278 spent on fees and slippage. iM-Best(Short): The model’s out of sample performance YTD is 0.3%, and for the last 12 months is -4.7%. Over the same period the benchmark SPY performance was -0.5% and 13.2% respectively. 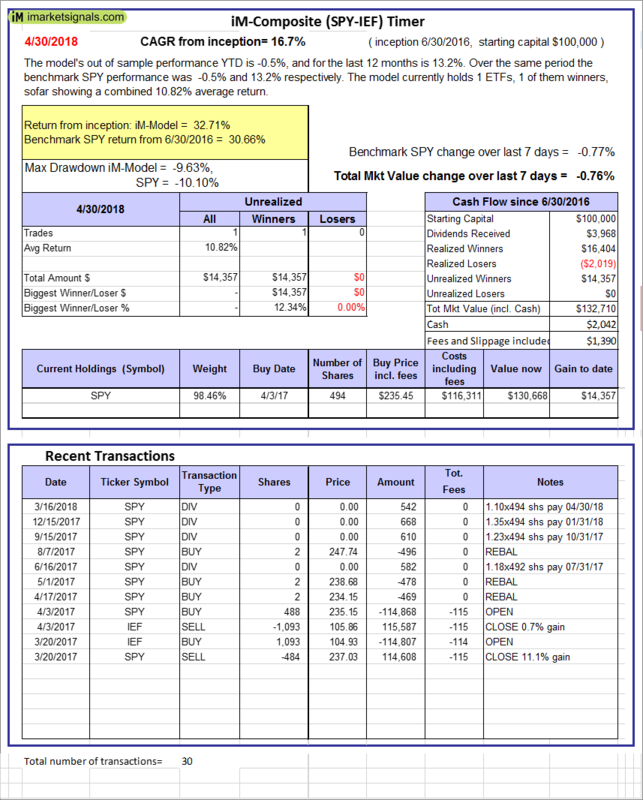 Over the previous week the market value of iM-Best(Short) gained 1.15% at a time when SPY gained -0.77%. Over the period 1/2/2009 to 4/30/2018 the starting capital of $100,000 would have grown to $91,456 which includes $91,456 cash and excludes $24,051 spent on fees and slippage. iM-Best2 MC-Score ETF System: The model’s out of sample performance YTD is -5.9%, and for the last 12 months is 1.6%. Over the same period the benchmark SPY performance was -0.5% and 13.2% respectively. 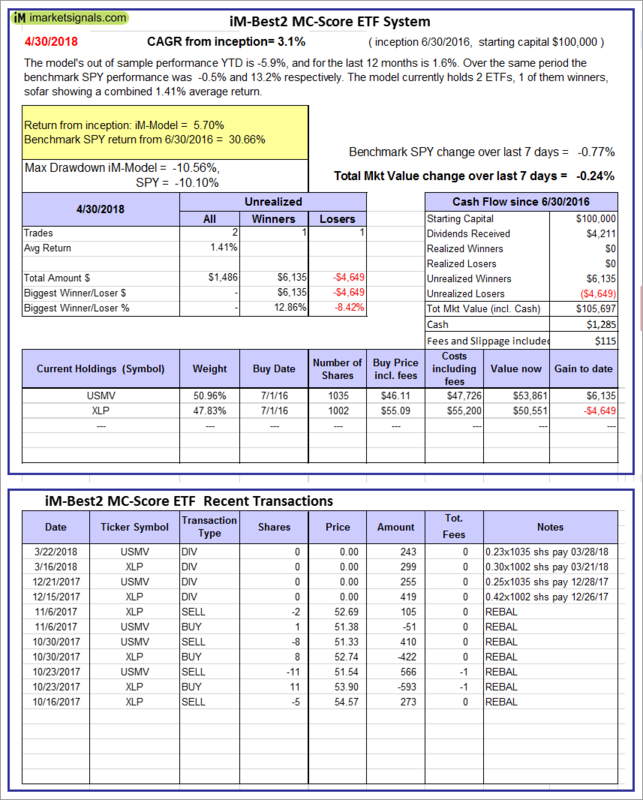 Over the previous week the market value of the iM-Best2 MC-Score ETF System gained -0.24% at a time when SPY gained -0.77%. A starting capital of $100,000 at inception on 6/30/2016 would have grown to $105,697 which includes $1,285 cash and excludes $115 spent on fees and slippage. 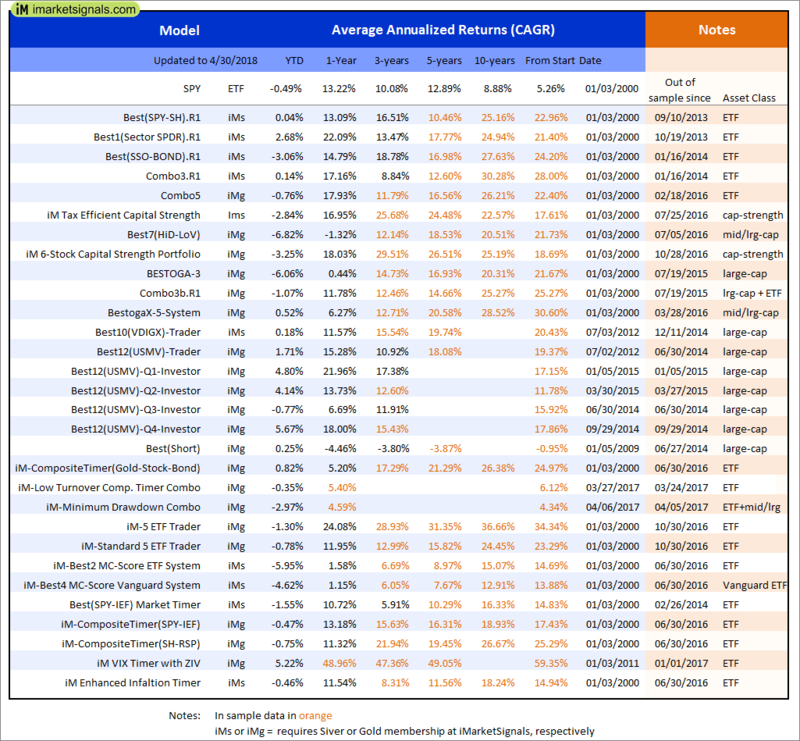 iM-Best4 MC-Score Vanguard System: The model’s out of sample performance YTD is -4.6%, and for the last 12 months is 1.1%. Over the same period the benchmark SPY performance was -0.5% and 13.2% respectively. 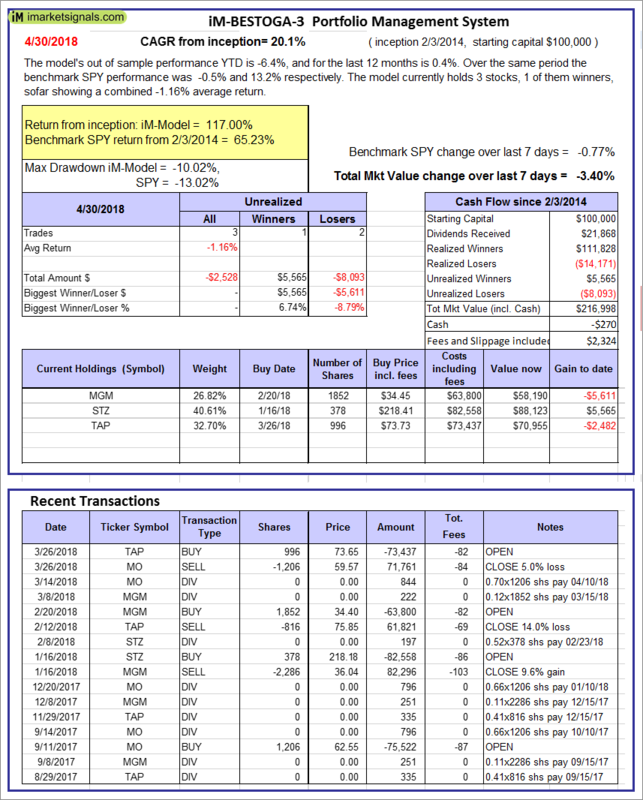 Over the previous week the market value of the iM-Best4 MC-Score Vanguard System gained 1.01% at a time when SPY gained -0.77%. 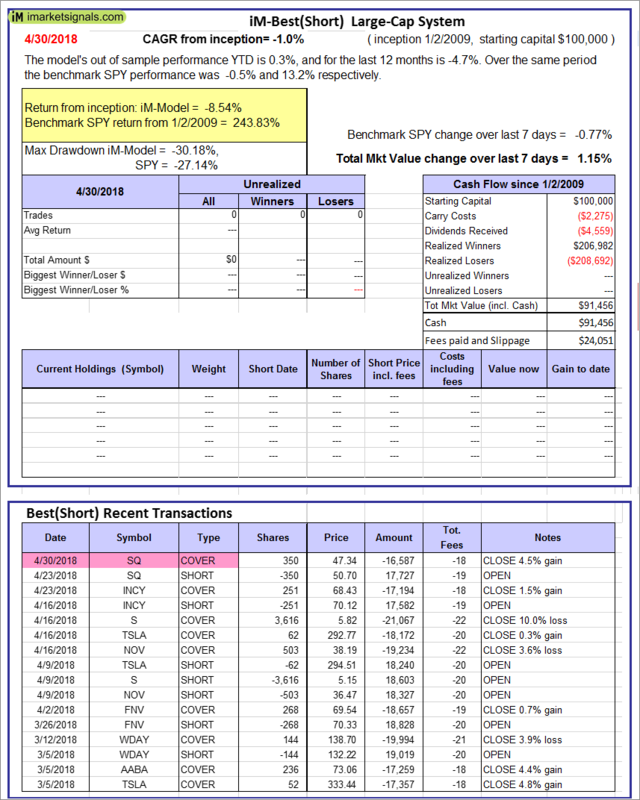 A starting capital of $100,000 at inception on 6/30/2016 would have grown to $105,728 which includes $3,960 cash and excludes $00 spent on fees and slippage. iM-Composite (SH-RSP) Timer: The model’s out of sample performance YTD is -0.7%, and for the last 12 months is 10.9%. Over the same period the benchmark SPY performance was -0.5% and 13.2% respectively. Over the previous week the market value of the iM-Composite (SH-RSP) Timer gained -0.55% at a time when SPY gained -0.77%. A starting capital of $100,000 at inception on 6/30/2016 would have grown to $129,025 which includes $2,714 cash and excludes $513 spent on fees and slippage. iM-Composite (SPY-IEF) Timer: The model’s out of sample performance YTD is -0.5%, and for the last 12 months is 13.2%. Over the same period the benchmark SPY performance was -0.5% and 13.2% respectively. 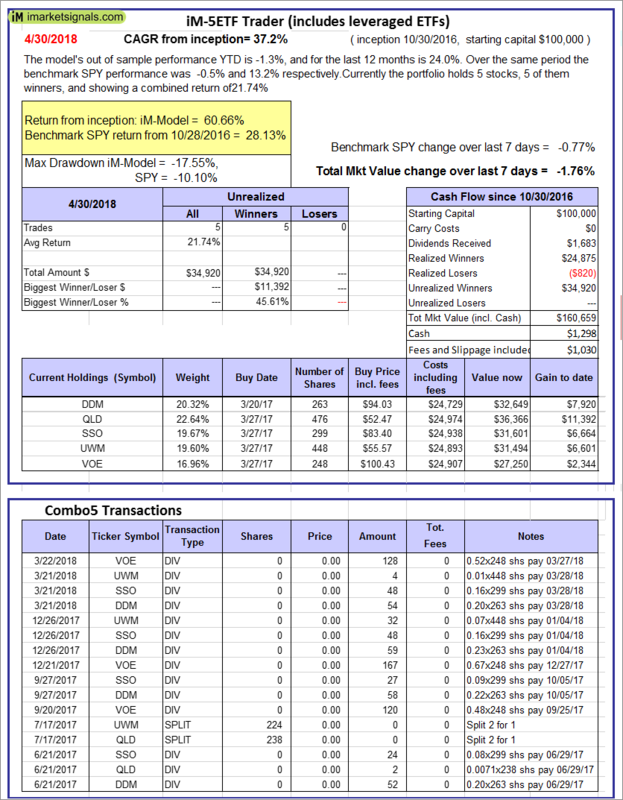 Over the previous week the market value of the iM-Composite (SPY-IEF) Timer gained -0.76% at a time when SPY gained -0.77%. A starting capital of $100,000 at inception on 6/30/2016 would have grown to $132,710 which includes $2,042 cash and excludes $1,390 spent on fees and slippage. iM-VIX Timer with ZIV: The model’s out of sample performance YTD is 5.2%, and for the last 12 months is 49.0%. Over the same period the benchmark SPY performance was -0.5% and 13.2% respectively. 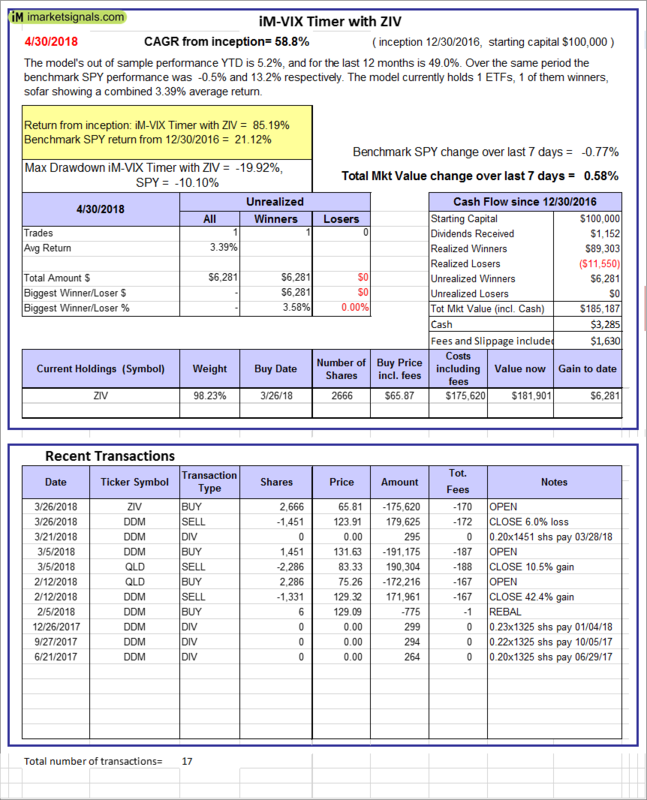 Over the previous week the market value of the iM-VIX Timer with ZIV gained 0.58% at a time when SPY gained -0.77%. A starting capital of $100,000 at inception on 6/30/2016 would have grown to $185,187 which includes $3,285 cash and excludes $1,630 spent on fees and slippage. iM-Composite(Gold-Stocks-Bond) Timer: The model’s out of sample performance YTD is 0.8%, and for the last 12 months is 5.2%. Over the same period the benchmark SPY performance was -0.5% and 13.2% respectively. Over the previous week the market value of the iM-Composite(Gold-Stocks-Bond) Timer gained -0.80% at a time when SPY gained -0.77%. A starting capital of $100,000 at inception on 6/30/2016 would have grown to $129,769 which includes $53 cash and excludes $1,955 spent on fees and slippage. iM-Low Turnover Composite Timer Combo: The model’s out of sample performance YTD is -0.4%, and for the last 12 months is 5.4%. Over the same period the benchmark SPY performance was -0.5% and 13.2% respectively. Over the previous week the market value of the iM-Low Turnover Composite Timer Combo gained -0.46% at a time when SPY gained -0.77%. A starting capital of $100,000 at inception on 3/24/27 would have grown to $106,700 which includes $1,867 cash and excludes $74 spent on fees and slippage. iM-Min Drawdown Combo: The model’s out of sample performance YTD is -3.0%, and for the last 12 months is 4.6%. Over the same period the benchmark SPY performance was -0.5% and 13.2% respectively. Over the previous week the market value of the iM-Min Drawdown Combo gained -0.42% at a time when SPY gained -0.77%. A starting capital of $100,000 at inception on 4/5/2017 would have grown to $104,589 which includes $820 cash and excludes $244 spent on fees and slippage. 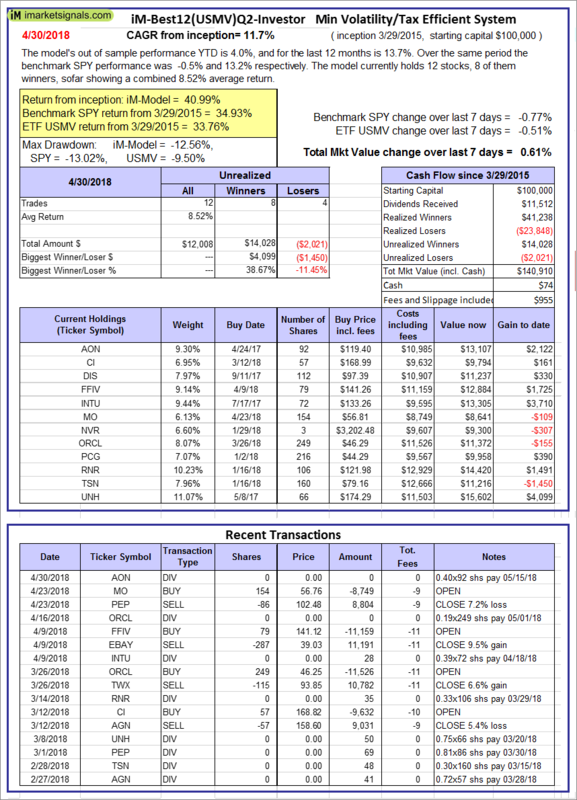 iM-5ETF Trader (includes leveraged ETFs): The model’s out of sample performance YTD is -1.3%, and for the last 12 months is 24.0%. Over the same period the benchmark SPY performance was -0.5% and 13.2% respectively. 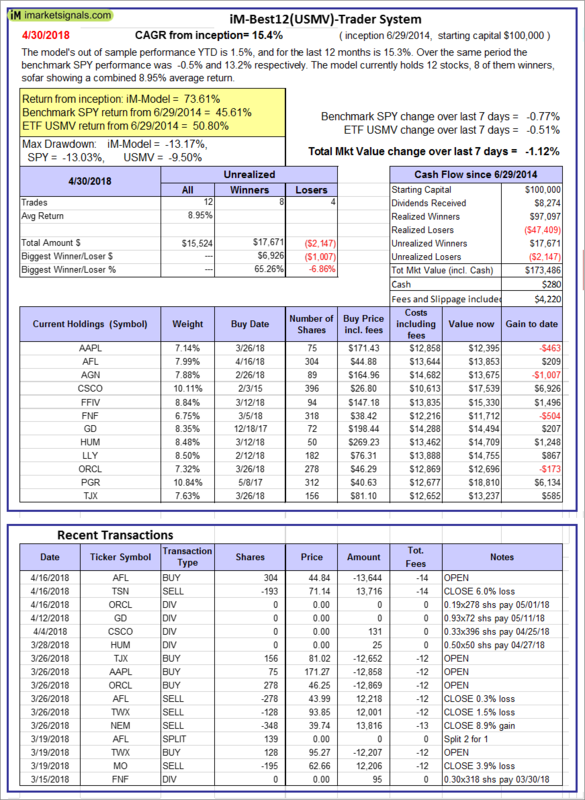 Over the previous week the market value of the iM-5ETF Trader (includes leveraged ETFs) gained -1.76% at a time when SPY gained -0.77%. A starting capital of $100,000 at inception on 10/30/2016 would have grown to $160,659 which includes $1,298 cash and excludes $1,030 spent on fees and slippage. iM-Standard 5ETF Trader (excludes leveraged ETFs): The model’s out of sample performance YTD is -0.8%, and for the last 12 months is 11.9%. Over the same period the benchmark SPY performance was -0.5% and 13.2% respectively. 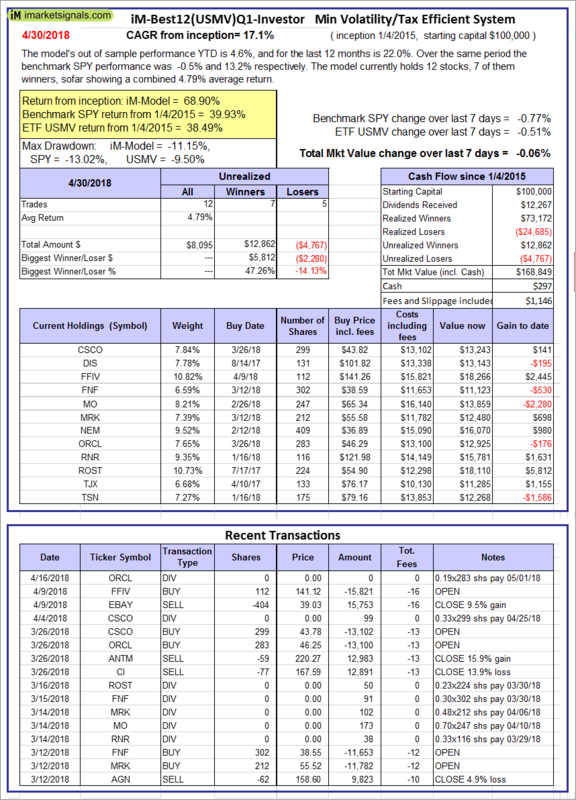 Over the previous week the market value of the iM-Standard 5ETF Trader (excludes leveraged ETFs) gained -0.94% at a time when SPY gained -0.77%. A starting capital of $100,000 at inception on 10/30/2016 would have grown to $124,652 which includes $2,520 cash and excludes $880 spent on fees and slippage.